I tend to spend the majority of January through April running around shouting, "It's sumo season!" at practically everyone I know (and everyone I don't). As much as I love sports and watching voluminous men compete against one another, this is not because I am super amped to watch Japanese wrestling. Instead my enthusiasm is about a fruit -- Sumo Citrus to be precise. Similar to their athletic counterparts, Sumos are also much larger and unwieldy than their peers. They are round, orange, and heavily dimpled, with a thick knob or knot at the top -- not too dissimilar from the hair style many sumo wrestlers tend to favor. And while they may not be the most attractive citrus in the produce section, Sumo Citrus (a trademarked name!) are by far the most delicious thing you can eat in the cold, barren, flavorless months of winter. Sumos, like the wrestlers, finds its origins in Japan where they are known as Dekopons. 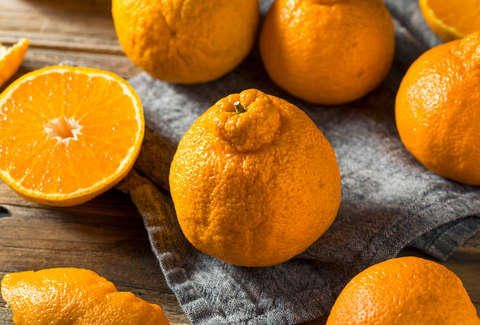 Japanese farmers spent more than 40 years breeding the fruit which combines the flavors of Satsuma Mandarins -- prized for their sweetness -- with the size of hefty Navel oranges. And in the case of Sumos, bigger really did turn out to be better. The fruit is incredibly easy to peel, like all the best mandarins, but much larger in size. Eating one Sumo feels like you are eating about four mandarins. The flavor is also incredibly sweet but with a tart kick at the end to help you remember that you are alive, and that this is in fact not a dream. They are best straight out of the fridge, where the cold somehow makes the fruit juicier. Sumos, or Dekopons, are so prized in Japan that they are often given as gifts. At one point, Dekopons cost as much as $10 a piece. And today, you can find everything from Dekopon flavored ice cream to Dekopon Hi-Chews. The fruit made its way over to the US only quite recently in produce terms. They have only been grown and sold since 2011, or for less than a decade. Now, over 30 farmers grow the citrus in California and Sumos can be found everywhere from Target to Whole Foods. I tend to purchase mine from the latter, where they often go for $5 a pound, which means I am easily spending $20 on four pieces of fruit during the height of my winter blues. The spendy grocery chain just recently knocked down the price, so there has never been a better time to go eat your weight in Sumos. And you better hurry -- the season ends this month, meaning once April is gone, you'll have to wait until January to eat the blessed citrus again. Khushbu is a senior food editor who dreams of being a fruit journalist. Follow her musings on mangoes, citrus, and more on twitter @khushandoj.